On the cover of my ‘A Land of Their Own’ is the first photograph ever of a HO. His name was Boyi. In 1862 his picture won a gold medal in London. It was part of Benjamin Simpson’s winning series on the London International Exhibition, as exhibit 4510 ‘Lurka Cole, Singhbhoom’. 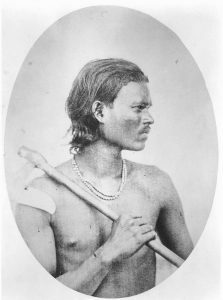 A few years later, 1868, it was published in volume 1 of a series of photo books by John Forbes Watson and John William Kaye, ‘The People of India’, as plate 18 ’Lurka Cole. Aboriginal (‘Fighting Cole’). Chota Nagpoor’. In that eight-volume series, the illustrations were still real photographs on thick paper, each glued to the pages by hand. The set is extremely rare and costly. In 2012, one set was sold for US $ 80,500. That was at an auction, which perhaps explains the last US $ 500. Years before, I found one complete set in a metal cupboard in the cellar of a library in Utrecht University. It was in bad state (and obviously not getting better), but I do hope they are taking more care now. I have also seen a (not too nice) reprint with printed photos which appeared some time ago in India. Back to pictorial history. In 1872, Edward Tuite Dalton used Simpson’s photo in his ‘Descriptive Ethnology of Bengal’ on plate XXVI, and gave the name as Boyi, 22 years, height 5 ft. 5 ½ in. (1.66 m), and his kili or clan as Kundada (‘Koada-dah’). The photo was lithographed and appeared with the other copied photographs after the text. Boyi’s portrait was used again in 1908, now by Herbert Hope Risley in his famous book ‘The People of India’ – not a photo album, but a serious and quite political text book, again with some pictures added at the end. He did not mention Boyi’s name, but gave ‘A “Ho” or Kol of Singhbhum’. Obviously, Risley had taken the picture (and the appellation HO) from Dalton’s book. So this photograph of Boyi – the first ever of a HO – served for well over fifty years. NB: I am glad to notice that it is used again after it appeared on my Facebook timeline on 4 October 2016.